Send your wishes of Mazeltov! 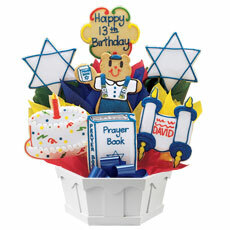 to the Bar Mitzvah boy or girl with this colorful cookie bouquet filled with cookies shaped like a torah, prayer book, stars of David, and more. This item is priced as a 7 cookie. Bat and Bar Mitzvah Party Theme Invitations and custom printed invitations in variety of styles, from traditional and religious to fun and contemporary. When selecting your Party Theme for your mitzvah celebration go tour sources for all your party supply needs. Decorating basic Party Supplies to develop the ceremony and parties to be planned for this life long memorable event for your sonar daughter. Imprinted Gifts or Party Favors make iota memorable event for your guests to take home.